The University of Maryland Medical Center (UMMC) in Baltimore has provided chest radiograph interpretation for the Immigration and Naturalization Service (INS) at all of its locations in the United States for the past nine years. At these numerous entry centers, immigrants and other potentially high-risk individuals entering the United States undergo tuberculosis (TB) screening. To efficiently manage the daily high volume workflow interpretation of procedures without compromising interpretation quality, UMMC’s Department of Diagnostic Radiology and Nuclear Medicine utilizes a computer-aided reporting system customized for tuberculosis screening. A similar type of customized workflow system, described in an article published in the Journal of Digital Imaging, could be deployed to improve interpretation efficiency for other types of screening uses, such as chest radiography of patients in intensive care units. The TB screening reporting software developed internally by the radiology department manages all incoming exams from the INS. Upon logging into the teleradiology portal, the number of unread exams are displayed. For each case, the radiograph appears with an ergonomic user interface and TB screening report template. If the radiograph contains features suspicious for TB, the radiologist checks the positive box, makes a comment regarding the suspicious finding, and calls the relevant INS site. The patient is then provided a comprehensive diagnostic evaluation at the site, and if necessary, treatment. Incidental findings are also reported from a displayed list and if needed, with individually typed comments. Each report is automatically generated based on the radiologist’s selections and comments and electronically transmitted to the corresponding INS site. Because rapid turnaround is important, residents monitor and read the incoming exams off hours 365 days a year. Their preliminary reports are subsequently read by an attending subspecialty chest radiologist. Both initial and final reports are stored in a relational database that enables a resident to compare his/her findings with that of the attending radiologist. Fourth year residents Michael Morris, MD, and Babak Saboury, MD, and colleagues conducted a study to determine the efficiency of the residents and the sensitivity and specificity of reporting. A total of 881,792 preliminary reports were generated over a nine-year period using the TB screening reporting software, an average of 286 reports per day. Using 0.18 RVU for CPT code 71010, the authors calculated that for a typical 10-hour workday, the residents spent 35 RVUs per day interpreting TB chest radiographs, or an equivalent of 7580 RVUs per year. The authors determined that the radiology residents exceeded the range of a typical academic full-time equivalent with chest radiograph reporting. They noted that this was in addition to the usual on-call emergency department and emergent inpatient responsibilities. The sensitivity among resident preliminary interpretations was also comparable to that reported for screening mammography and within the range reported for screening chest radiographs. These have been reported to be in the low 70th percentile to high 90th percentile, with the average in the 80% range. The authors identified 104 false positives and 1014 false negatives for TB, with an overall sensitivity of 77%, and a specificity of 99.9%. “By making report generation more efficient with the custom-designed interface, a radiologist can more fully focus on the radiograph. Decreased reliance on dictation and typographically correct reporting transcription, which can be error prone and tedious, allows the radiologist to focus completely on the image interpretation and clinical diagnosis. Through reduction of unnecessary attention costs, the radiologist becomes fully immersed in the feeling of involvement, enjoyment and focus,” they commented. Morris M, Saboury B, Bandla N, et al. Computer-Aided Reporting of Chest Radiographs: Efficient and Effective Screening in the Value-Based Imaging Era. J Digit Imaging. Published online February 2, 2017. 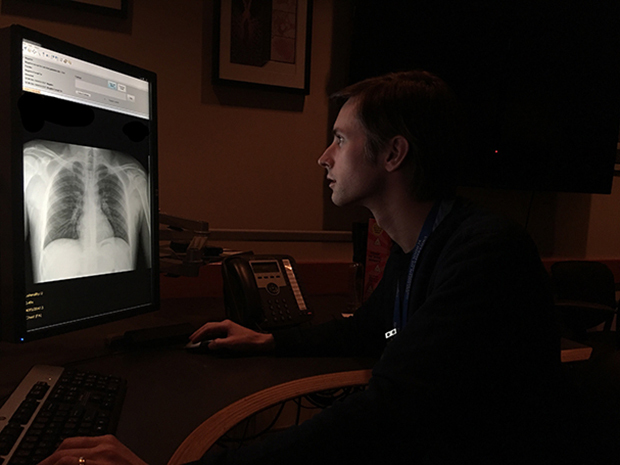 Computer-aided reporting software expedites chest radiograph interpretation. Appl Radiol.